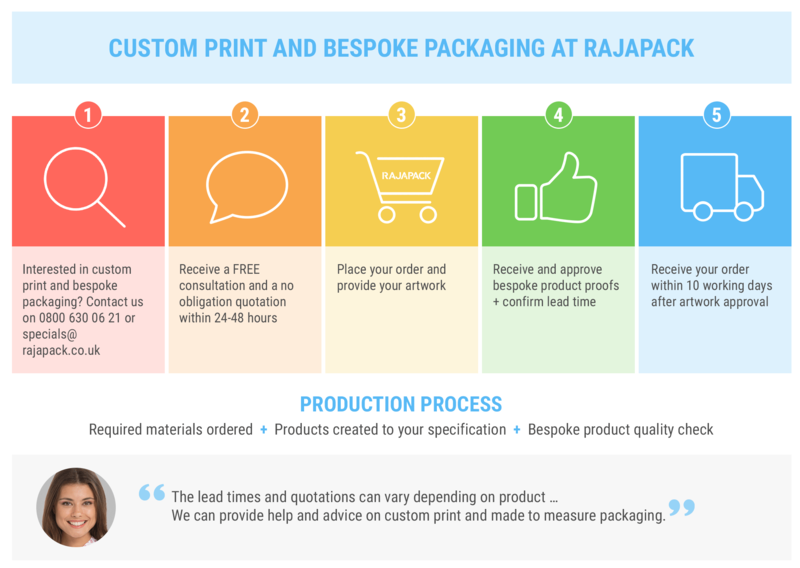 Since we launched RAJAPrint tapes, our online custom packaging tape tool back in 2015, we’ve been continually developing our range of custom packaging products. We know it’s an area that’s important for businesses up and down the UK, so we’ve decided to focus on custom print in detail. We’ll be looking at what benefits it can offer businesses, covering everything from how to get set-up, to a full breakdown of the process, with expert opinion and real customer stories of how it can be adopted. Finally, we’ll be rounding off with five of our favourite custom packaging products to give you a taste of what’s available. What benefits can custom print packaging offer a business? In the past we’ve covered how custom packaging can increase profits by encouraging repeat purchases. With more custom packaging items available than ever before, the positive impact it can have on the customer experience, satisfaction and brand feeling has continued to grow. As markets become more competitive, ensuring your brand stands out and makes customers feel connected and engaged has become increasingly important. Custom packaging offers a key channel through which to do this, with the opportunity to increase company awareness and instil confidence at the point of delivery. From the moment a customer begins their journey by landing on your website, your values are conveyed through the tone of voice, creative design, and messaging. By using custom and bespoke packaging, these values are continued from the moment they checkout and pay, across packaging including branded shipping boxes, packaging tape and sealed bags. The consistency that this brings to the journey can make customers feel engaged and connected at every touchpoint, enhancing their experience and loyalty. While in transit, being handled or carried by customers, clear branding can mean your items are instantly recognisable with noticeable colours and design. Many businesses now use their brand colours across all packaging, from cardboard boxes and tape that seal and ship their items, to the polythene bags that protect them. The opportunity to personalise through your custom print packaging is greater than ever, allowing businesses to be unique and communicate their brand values as soon as a parcel is received, before it has even been opened. This helps to establish a sense of identity and makes a purchase feel more personal and inclusive, increasing loyalty. What barriers are there to adoption? As with most new technologies, when custom print packaging was first developed it could be a lengthy process for companies to adopt. Today, this is far from the case. Over the past few years we’ve worked closely to develop a streamlined process in partnership with our suppliers, printers and customers that makes it simple, quick and easy for any business to adopt high quality custom print packaging across a wide range of items. As technology has evolved and efficiencies have improved, the costs of custom print have also come down. To help more businesses get started in this area, we have free artwork and print promotions across both custom RAJAprint bags and RAJAPrint tapes, offers expire 31st August 2018. Later in this post we’ll outline the custom print process in detail, so you can understand the bespoke process. 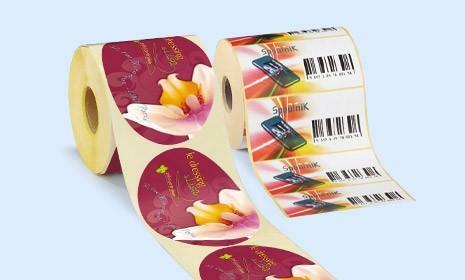 For RAJAprint tapes, customisation can be applied and uploaded directly from your web browser making things even easier. Almost all our custom print products are turned around in 10 working days, depending on product, once artwork has been approved, so you won’t be waiting long for your packaging. Bespoke made to measure packaging is something that we offer to all our customers. Moving from standard packaging to a tailor-made solution that’s been created with specific requirements in mind can offer a range of benefits across the full packaging process. Just a few of the ways we have helped customers include cutting down on the total packaging needed while improving packaging process efficiency, enhancing product presentation and better securing items in transit. Through a consultation we discuss specific packaging requirements as every business is different. These can be around things such as securely packaging awkwardly shaped items, quick and easy ways to pack large amounts of similar shaped products, or ways we can enhance the strength and simplicity of their packaging while reducing waste. It’s always created with our customer’s requirements first and is a standard service that is available to everyone. We caught up with two of our customers, to hear their experiences of bespoke packaging with a made-to-measure product, what was involved and what it had to offer. Original packing process: Corrugate postal mug boxes were used for most of their product lines, packing with protective packaging such as void fill that fitted neatly around the product, then closing with tape to seal. The mug box offered rigid corner and side protection, and the addition of void-fill ensured the product remained safe against knocks during shipping. As our customer sends between 1 and 4 of the products at a time, they found they were using excessive void-fill particularly for smaller orders, the overuse of protective packaging resulted in poor presentation and they wanted to improve their customer’s experience. They came to Rajapack with the idea of getting three more sizes of mug box to limit the void-fill used. 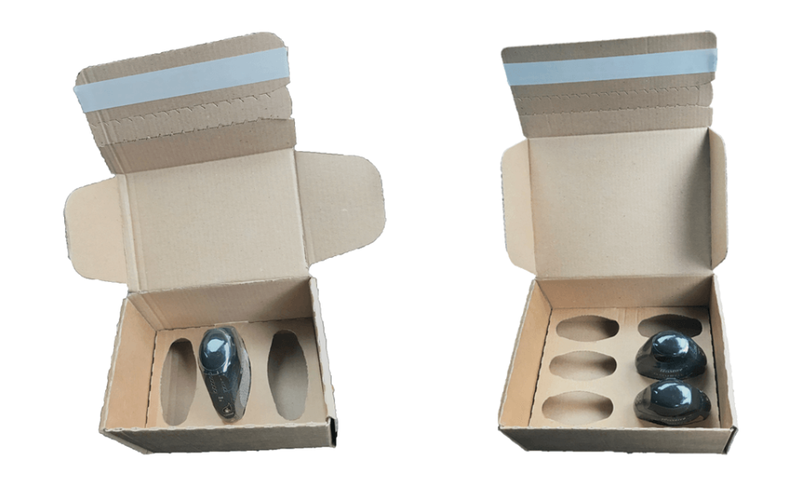 Bespoke team solution: After a consultation with the customer, we were able to advise that increasing the range of mug-boxes wasn’t the most efficient solution. They would lose the economies of scale by switching from one to multiple lines and our focus is all about value added to our customers. We worked with our bespoke manufacturer to design a new self-seal box with made-to-measure fittings to hold their products in place. The redesign included a self-seal closure to replace the use of packing tape and an integral fitting, cut to size that secured the products which eliminated the requirement for any void-fill. We designed two new packaging options; one to hold 1 or 2 products, and the other to hold up to 4, to consolidate the types of packaging they needed to use and get them the best value for money. The redesign improved efficiency in their process, making it quicker and easier to package and post their items whilst reducing resources and overall costs. Original packing process: An ecommerce business selling items online, they already had bespoke boxes to send their products but were experiencing an increase in returns from damages in transit. The plastic lids of the aromatherapy bottles are particularly fragile which made them susceptible to breaking and leaking in transit, so our customer approached us to discuss a redesign. Bespoke team solution: We worked with our partner to design a solution which suspended the bottles within the box by supporting the lid and the base. This internal support holds the bottles in place with additional support around the lid to improve the protection and reduce the chance of damages during transit. It was very important for our customer that this new solution didn’t increase the packing time of these, so we ensured the additional support became part of the box design keeping it as one unit. We also added a self-seal closure to reduce packing time and to save the customer on tape costs. Below we’ve outlined all steps of the custom print process, so you can see the exact process of bringing branded packaging into your business. We’ve streamlined this process to make it as quick and easy for you as possible! We’ve been working with our suppliers and customers to develop our range over the past few years, extending out from bags and tape into new packaging types such as tubing, labels and even bottle boxes. Custom Tape was our first range of custom print products, and we’ve been extending the range out ever since. Our newest addition is this self-adhesive paper tape, which we love because it can add great stand out to parcels and packages, while being 100% recyclable and great for lowering your business’ impact on the environment. This high-performance tape quickly adheres to all surfaces and is made from 57 gsm silicone free paper which easily tears by hand. 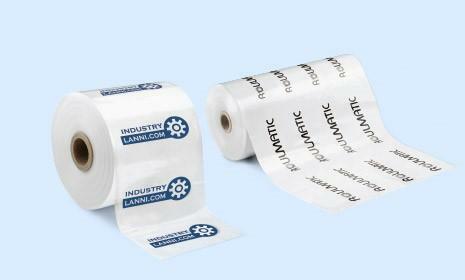 One of the simplest and easiest way to add branding or messaging to any item is through the use of a label. Our varied options of custom print labels guarantees excellent print quality to get your message noticed instantly. Whether it’s communicating special offers, brand messaging or business details, we offer a wide range of materials and finishes, from metallic labels and digital prints, catered for all industries with strong adhesion for any surface. Perfect to add some personality to your packaging. Custom printed bags have been part of our core range since we launched RAJAPrint in 2015, but the newest addition to our range are these stylish gloss laminated bags. Made from 150 gsm laminated gloss paper, they feature a reinforced base for support with self-coloured rope handles. The laminated gloss gives a premium feel, and with your logo or business names printed on both sides, they’re perfect when you need to add a little luxury to your customer packaging. As an alternative option, matt laminated are also available for a softer feel, while maintaining the premium look. Custom printed boxes in made to measure sizes have been a core part of our range for a while now, but this latest addition is something we’re particularly proud of. Perfect for micro or craft breweries, our new bottle presentation boxes can hold 330ml or 500ml bottles, and feature a strong carry handle, robust construction and protective integral dividers. The 4 colour print process on these boxes can add your business logo, brand or message combined with cut out panels so the bottles can be seen, making them perfect as gift boxes too. Our final custom print packaging pick is layflat tubing. This polythene material allows you to quickly and easily make your own bags on site, simply with the use of a heat sealer. By adding a business logo or message to the tubing, you can create your own branded bags, perfect for sealing products prior to shipping, for storage or giving to customers at the point of sale. Bag size can be customised to your requirements and these polythene bags offer excellent protection from dust and water, giving ultimate protection for items. Finally, we spoke to Sara Savage from the Bespoke team here at Rajapack UK, to get her thoughts on custom print and bespoke packaging. “There are many types of customers with different needs that approach us, firstly clients that would like to improve their brand experience by creating exclusivity and quality with custom print customisations. We also have clients needing made-to-measure solutions to house products that offer both robust protection and are aesthetically designed. We work to the clients requirements in terms of cost and other KPI’s, such as eco-friendly factors that might be considered, and provide suitable options. If you’d like further information on custom print or bespoke made to measure packaging and how it can elevate your business, simply get in touch with our team of packaging experts who are on hand to help. Simply visit www.rajapack.co.uk or contact our team on 0800 630 06 21, or specials@rajapack.co.uk. This entry was posted in Packaging Industry News and tagged customisation, Expert packaging guides on May 31, 2018 by Rajapack UK. Thank you for writing and sharing this informative article.Your writing technique is impressive and enjoyable to read. You have many interesting points of view that give me pause to consider. I am a fan of informative content, especially when it’s this good. Your article is well-written (of course) and just what I like to read. You’ve done an excellent job with this article. It’s not only informative, but it keeps the reader’s interest and it’s just plain smart. Thank you. While reading the article, I could envision the writer sitting alone thinking. I can tell that you worked very hard on this article. Thank you. I like your blog, very practical information. Getting a custom log in UK, I personally think is a great idea and if your logo clicks in the eyes of its customers you can definitely capture a loyal client audience. A great article, very well written and useful. Thank you for your efforts.